The Department of Electronics and Communication Engineering was established in the year 2001 with the vision to become a centre of excellence to provide endowment education and produce innovative engineers to excel at international level. The Department Laboratories are fully air conditioned, well equipped with computer systems highly configured computational units. The Department has well experienced and certified faculty in all specializations such as VLSI design, Applied Electronics, Microwave & Optical Engineering Communication Systems, Medical Electronics, Digital Systems and Embedded systems. Colonel Dr.JEPPIAAR CENTRE FOR KNOWLEDGE SHARING is collaborated with NIELIT, Chennai accompanied by fully equipped Laboratory center along with required Hardware and Software tools. The Department has signed MoU’s with Government sector and Private sectors such as NIELIT-Chennai, BSNL –Chennai, Vi Micro Systems Pvt. 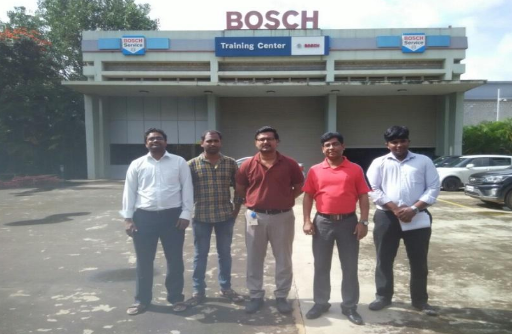 Ltd., – Chennai for training both the Faculty and students to provide joint venture programs, project work, problems solving and Research & Development. Promotion of Academic – Industry interaction and English Language proficiency training is provided. The Department has also initiated two professional societies namely, IEEE Communication Society and IETE society. The department organizes various training programs with renowned expert trainers from industries and multinational companies to improve the oral, written skills, aptitude skills, of students so they are easily hired by leading core and IT industries. The Department excels with an outcome of 90% of students getting placed in various top companies like Infosys, Wipro, Cognizant, Capegemini, CSC, NTT Data, MINDTREE, L&T InfoTech, Excela.com & etc. Students pursue higher studies in leading universities abroad and the department secured Anna University Gold Medal during the year 2006, 2013 and earns more Anna University ranks every year. Our students of ECE have participated in The Smart India Hackathon 2017 under the Government of India in an innovative notion. Faculty members innovate, conduct and research for their self renewal, keep abreast with changes in technology, and develop expertise for effective implementation of curricula. Our faculty members have received honors and awards for remarkable services in academics and research. The department faculty has filed patents to carry out the research work. The faculty members attend FDPs and workshops regularly to develop their teaching and research skills. To become a centre of excellence to provide quality education and produce creative engineers in the field of Electronics and Communication Engineering to excel at an international level. M1 Inculcate creative thinking and zeal for research to excel in teaching-learning process. M2 Create and disseminate technical knowledge in collaboration with industries. M3 Provide ethical and value based education by promoting activities for the betterment of the society. M4 Encourage higher studies, employability skills, entrepreneurship and research to produce efficient professionals thereby adding value to the nation’s economy. PO1 Engineering Knowledge: Apply the knowledge of mathematics, science, engineering fundamentals, and electronics engineering specialization to the solution of complex engineering problems. PEO1 Produce technically competent graduates with a solid foundation in the field of Electronics and Communication Engineering with the ability to analyze, design, develop, and implement electronic systems. PEO2 Motivate the students for successful career choices in both public and private sectors by imparting professional development activities. PEO3 Inculcate in the students’ ethical values, effective communication skills and develop the ability to integrate engineering skills to broader social needs. PEO4 Impart professional competence, desire for lifelong learning and leadership skills in the field of Electronics and Communication Engineering. PSO1 Competence in using modern electronic tools in hardware and software co-design for networking and communication applications. PSO2 Promote excellence in professional career and higher education by gaining knowledge in the field of Electronics and Communication Engineering. PSO3 Understand social needs and environmental concerns with ethical responsibility to become a successful professional. 1. Prakasam V, Rajshekhar Datta, Roger Agash A S, Royston Britto B, N Kiranmayee published a paper titled as “Wireless Black Box Using MEMS Accelerometer AND GPS Tracking For Accidental Monitoring Of Vehicles” on 23rd& 24th March 2018, conducted by Jeppiaar Engineering College,Chennai. 2. 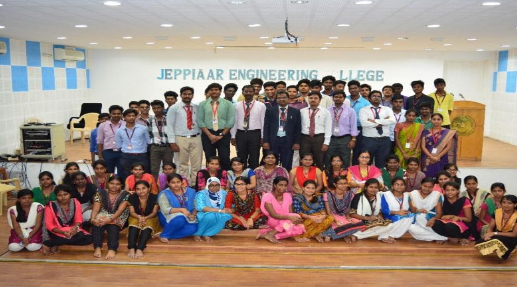 C.Sanjeeth Kumar, L.S.Sibi Rajan, K. Tharun Kumar, V.Varadha Rajan, B Arun VijayaKumar published a paper titled as “Cognitive Industrial Load Control In A Virtual Reality” on 23rd& 24th March 2018, conducted by Jeppiaar Engineering College,Chennai. 3. K.G. 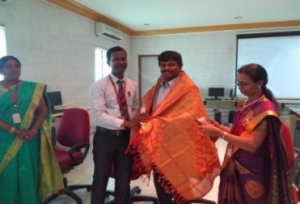 Vijhay Sundar, S. Rabeesh Raja, R. Manikandan, M. Suman published a paper titled as “Baggage Tracing and Handling System using RFID and IoT for Airports” on 23rd& 24th March 2018, conducted by Jeppiaar Engineering College,Chennai. 4. R.S.Vignesh, G.Mariya Sunil Kennet, R.Sri Ram, V. Vasantha Kumar, T.R.Chenthil published a paper titled as “Automatic power generation in Train” on 23rd& 24th March 2018, conducted by Jeppiaar Engineering College,Chennai. 5. M.Dhanu Sankar, A.Leo Martial, Chaganti Ajay Sai Kumar Chowdray, N.H.Irfan, T.R.Chenthil published a paper titled as “Development Of Ambient Environmental Monitoring System Through Wireless Sensor Network (WSN)” on 23rd& 24th March 2018, conducted by Jeppiaar Engineering College,Chennai. 6. R.P.Suresh, V.Venkatesh, B.G.Saravana Kumar, S.Rajapandian, T.Jagadesh published a paper titled as “Development Of Algorithm For Target Detection And Motion Parameter Estimation Using TRT-SGRFT” on 23rd& 24th March 2018, conducted by Jeppiaar Engineering College,Chennai. 7. Akshayasri.M, Blessy.P, Deepa.J , Benitto Jeraldine.G, M. Suman published a paper titled as “Vehicle Registration Details Extraction System Using GSM” on 23rd& 24th March 2018, conducted by Jeppiaar Engineering College,Chennai. 8. 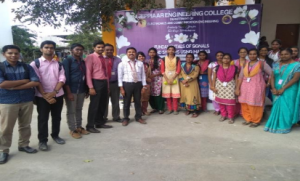 N. Ponni, R S Rakshana Sri, M Shanthini, V Suganthi, V Angeline Princy published a paper titled as “Smart Monitoring Of Water Tank Using IOT Cloud Server ” on 23rd& 24th March 2018, conducted by Jeppiaar Engineering College,Chennai. 1. Abdul Rahman Siddique.Q, Amarnath.P, Akil Raj.D, Karthik.S published a paper titled as “Development of smart hearing intelligence system using bone conduction technique” in Third Inter National Conference on Science, Technology, Engineering and Management on 23rd& 24th March 2017, conducted by Jeppiaar Engineering College,Chennai. 2. U.Monica, Monishanelsarani, Ranirajeswari, Sakthi thamilizhini prabha published a paper titled as “Aadhar card aided payment at the tolls (automatic) traffic control system by using GPS and QR code”in Third Inter National Conference on Science, Technology, Engineering and Management on 23rd& 24th March 2017,conducted by Jeppiaar Engineering College,Chennai. 3. M.Pavithra, S.Pavithra, S.Srindhi, R.Usha, S.Ranjith presented a paper titled as “Digitalized Purchase with no billing using IOT application” in Third Inter National Conference on Science, Technology, Engineering and Management on 23rd& 24th March 2017 ,conducted by Jeppiaar Engineering College,Chennai. 4. J.Agnes Jennefer, A.Bhuvana Angel, G.Lakshmi Prasanna presented a paper titled as “Wireless Sensor Network Based Border Surveillance Using Multiple Signatures”in Third Inter National Conference on Science, Technology, Engineering and Management on 23rd& 24th March 2017 ,conducted by Jeppiaar Engineering College, Chennai. 5. V .Vaishnavi ,M. Remila Daslin, R .Sri Brindha presented a paper titled as “Real Time Implementation of Smart Trash Can Using IoT ”in Third Inter National Conference on Science, Technology, Engineering and Management on 23rd& 24th March 2017 ,conducted by Jeppiaar Engineering College, Chennai. 6. Ranjani V, Sowmya J, Veeralaksmi P presented a paper titled as “Smart sensor interface reconfiguration for industrial parameter survey in iot environment” in Third Inter National Conference on Science, Technology, Engineering and Management on 23rd& 24th March 2017 ,conducted by Jeppiaar Engineering College, Chennai. 7. A.Roche Nishanth, S.Subramanian, S.Vivek Adithya presented a paper titled as “FPGA Implementation of Adaptive Beamforming using Three Radial Basis function Neural Networks” in Third Inter National Conference on Science, Technology, Engineering and Management on 23rd& 24th March 2017 ,conducted by Jeppiaar Engineering College, Chennai. 8. P.Rubini, C.Purni, R.Soniya presented a paper titled as “Implementation of Smart Tillage System (STS) Using Wireless Technology” in Third Inter National Conference on Science, Technology, Engineering and Management on 23rd& 24th March 2017 ,conducted by Jeppiaar Engineering College, Chennai. 9. J.S.Senovia Rodriguez, M.Sony Jenusha, I.Vino Glora, M.Yuvamathi presented a paper titled as “Diabetic Retinopathy screening using skin locus model” in Third Inter National Conference on Science, Technology, Engineering and Management on 23rd& 24th March 2017 ,conducted by Jeppiaar Engineering College, Chennai. 1. 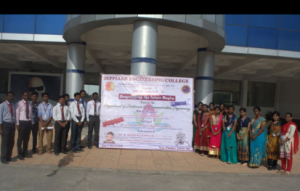 N.Kandasamy suryaprakash,T.N.Devaprakash presented a paper titled as “Design of Low power Multipliers with Braun Architecture using Column Bypassing Multipliers” in Third Inter National Conference on Science, Technology, Engineering and Management on 30th& 31st March 2016 ,conducted by Jeppiaar Engineering College, Chennai. 1. M. Shanmathi, Catherin Infant,A Sujitha. 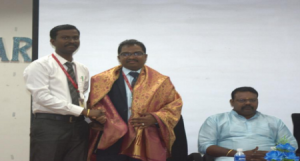 K. V. published a paper titled “Region Based Segmentation and Analysis of Carpal Bones Using Fuzzy C Means Algorithm” in Inter National Conference on Science, Technology, Engineering and Management on 23rd March 2015 conducted by Jeppiaar Engineering College, Chennai. 2. Mathumitha.G,Dorathe.V2 published a paper titled ―Reduction Of Leakage Power In Full Adders At 32nm Technology in National Conference on “4th National Conference on Recent Advancements in Signal Processing and Communication(NCRASPC-2015)”. 3. 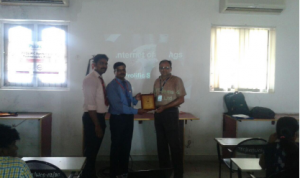 DinuAnand.U,Kandasamy suryaprakash.N published a paper titled “Efficient Balancing Of Frequency Response in Head phones Using Moving Average Filter and FFT Algorithm” in National Conference on “Innovative Vogue In Electronics And Communication 2015” on 27th March 2015, conducted by Madha Engineering College, Chennai. 4. T.S.Jafiah , B.Padminipriyanka, published a paper titled “LI-FI: Data transfer using light” in National Conference on “Innovative Vogue In Electronics And Communication 2015” on 27th March 2015, conducted by Madha Engineering College, Chennai. 5. 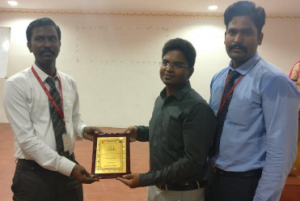 R.Aravind,HARI NARAYANAN.M published a paper titled “A New Defected Ground Structure For Proximity Coupled Antenna” in National Conference on “Innovative Vogue In Electronics And Communication 2015”on 27th March 2015, conducted by Madha Engineering College,Chennai. 6. 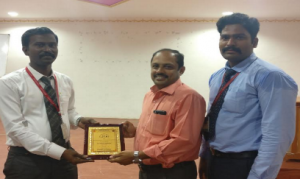 HareeshBabu M.V, Kalicharan G published a paper titled “Innovative With Gi-Fi Technology “ in National Conference on “Innovative Vogue In Electronics And Communication 2015” on 27th March 2015, conducted by Madha Engineering College, Chennai. 7. 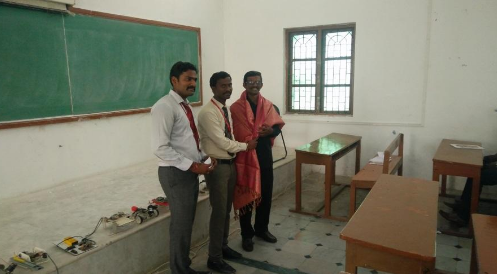 S. SiddhiGupta,A.Arulmozhi published a paper titled ―Virtual Touch Based Real Time Red Object Tracking Using Blob Analysis Algorithm in National Conference on “Innovative Vogue In Electronics And Communication 2015”. 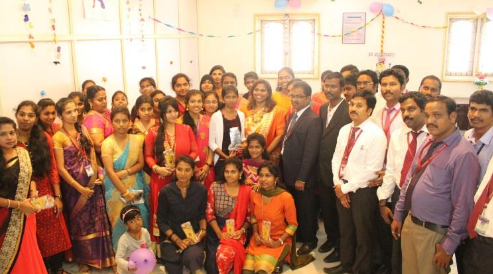 on 27th March 2015, conducted by Madha Engineering College, Chennai. 3. Mr.M.Suman Implementation of WSN’s Device Addressing, Data Aggregation and Secure Control In IOT Environment Journal For Advanced Reserch In Applied Science.Vol.5.Issue 4-April 2018. 4. Mr.T.R.Chenthil, Mr.G.C.Jagan Intrusion Detection with Smart Dust Using Wireless Sensor Networks Journal For Advanced Reserch In Applied Science.Vol.5.Issue 4-April 2018. 5. Mr.J.Jebastine, Mr.T.Jagadesh Design and Modeling of a Pendulum Driven Hopping Stumpy Robot Journal For Advanced Reserch In Applied Science.Vol.5.Issue 4-April 2018. 6. Mr.T.Jagadesh, Mr.J.Jebastine Design of FIR Filter Architecture using Majority Function based 6T-Full Adder Journal For Advanced Reserch In Applied Science.Vol.5.Issue 4-April 2018. 7. Mrs.Dalphin mary.F, Ms.Vishnupriya .T, Mrs.Kiranmayee.N An Implementation of FPGA Based smart meter for Home Energy Management Journal For Advanced Reserch In Applied Science.Vol.5.Issue 4-April 2018. 8. Mr.J. Ranjithkumar Automatic Guiding System For Blind People Journal For Advanced Reserch In Applied Science.Vol.5.Issue 4-April 2018. 9. Mr.J Ranjith Kumar, Mr.Sakthivel Wsn Based Street Light Control And Monitoring System Journal For Advanced Reserch In Applied Science.Vol.5.Issue 4-April 2018. 10. Ms.P Jeya Priyanka , Ms.Madona B Sahaai, Ms.Lekshmi P Surendran Design and Implementation Of Adiabatic Logic Using Low Power VLSI Circuits Journal For Advanced Reserch In Applied Science.Vol.5.Issue 4-April 2018. 11. Mr.G.C.Jagan, Mr.T.R.Chenthil Analysis of Improving Energy Efficiency in Wireless Communication and Networks Journal For Advanced Reserch In Applied Science.Vol.5.Issue 4-April 2018. 12. Mr.S. Ramesh, Mr.T. Jagadesh Neonatal Monitoring And Security System Using Passive Rfid Tags Journal For Advanced Reserch In Applied Science.Vol.5.Issue 4-April 2018. 13. Mr.G.Balachandran Mr.,R.Tharun, Dr.S.K.Padmanabhan Automoted Toll Fare Collection System In Toll Gate By Linking Vehicle Register Number To Bank Account Journal For Advanced Reserch In Applied Science.Vol.5.Issue 4-April 2018. 14. Ms.A. Santhiya, A. Ms.Keerthika SPCDP: Synthetic Personality Of Crime Detection And Prevention Journal For Advanced Reserch In Applied Science.Vol.5.Issue 4-April 2018. 15. Ms.Angeline Princy v An Efficient Video Compression Technique Based On Three-D Hadamard Redesign Using Component Based Absolutely Intra Mode Desire Journal For Advanced Reserch In Applied Science.Vol.5.Issue 4-April 2018. 16. Ms.A.Pitchaikani 4G - New Era In Wireless Technology Journal For Advanced Reserch In Applied Science.Vol.5.Issue 4-April 2018. 17. Ms.Vishnupriya .T, Mrs.Dalphin mary.F Energy Efficient Resource Allocation In Cognitive Radio Networks Using AR Strategy Journal For Advanced Reserch In Applied Science.Vol.5.Issue 4-April 2018. 18. Mr.S.Ranjith, Mr.sR.Rajarajan Power Efficient & Reduced Probability Collisions In Wireless Sensor Network With RTSP Technique Journal For Advanced Reserch In Applied Science.Vol.5.Issue 4-April 2018. 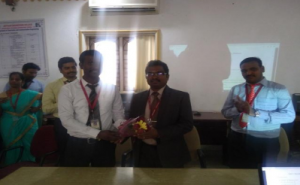 The guest lecture on Digital India Smart Sities by Mr.M Thirumalai chief guest was done on March 24 ICONSET 2K17 . Guest Lecture on “IOT Applications in Communication Engineering and Robotics” on 7th July 2018 at VLSI Lab. All the Second year students with two staff members benefited in the field of real time communication system using IOT and robotics. Session Handled by Mr. Raghul Project Engineer. The guest lecture on “Current Trend in Robotics” with introduction of Mr.Aravindhan. 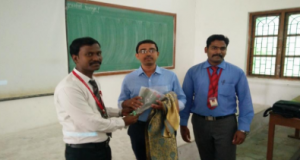 Felicitation of guest was done by HOD of ECE DEPT Dr.J.Jebastine on August 2nd 2018. The objective of this guest lecture was to make concepts clarification about the infrastructure establishment with current trends on robotics and different parameters in design of LEMA labs. NSIC facilitates Micro, Small and Medium Enterprises with a set of specially tailored scheme to enhance their competitiveness. NSIC provides integrated support services under Marketing, Technology, Finance and other Support service. NSIC workshop is been very useful for third year students they learn so many technical things which they are learn apart from syllabus the event dated on 11-9-2017 at VLSI lab. 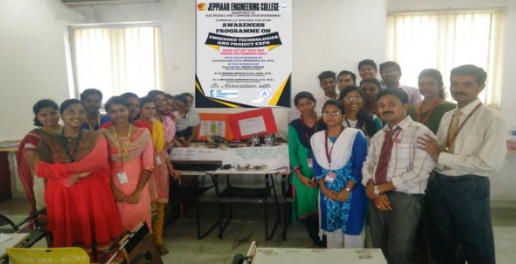 Robotic Arm Workshop its has been very innovative for the students to build a new project ideas and to make their own project material overall third year students has been benefitted which is dated on 13.9.2017 . 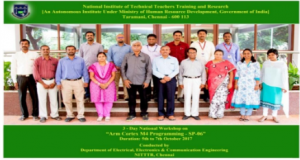 Our staffs has attended the workshop in the outside of college NITTR based on ARM CORTEX PROGRAMMING which is dated on October 5th to 7th 2k17. Two days workshop on “Fundamentals Of Signals And Systems Using MATLAB” organized on 9.2.2018&10.2.2018 @ Seminar Hall. 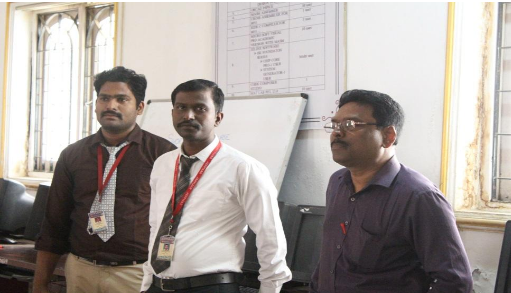 All the participants are trained in the field of signal system applications & implementation. Guest Lecture on “ IOT Applications in Communication Engineering and Robotics” on 18th FEB 2018 at VLSI Lab. All the Second year students with two staff members benefited in the field of real time communication system using IOT and robotics. 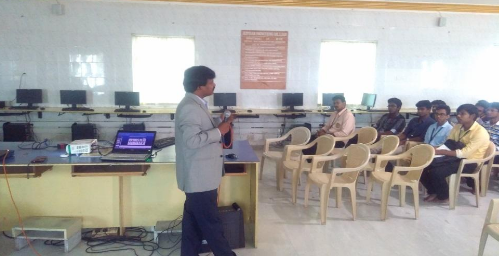 Session Handled by Mr. Raghul Project Engineer & Mr. Aravindan Product Developer SKY Technologies, Chennai. The Department of ECE has successfully conducted one day workshop on “Demystifying the Future Mantra “ on 1 st March 2018 at Library Seminar Hall from 9am to 3pm.The chief Guest of this Workshop is Dr. J. Antony Jerald, who is one of the best of the Psychologist and Alternative Medical practitioner in Chennai. He is an expert in sharing his ideas with the common people. Irrespective of the field, he gets to know of it first-hand either through research, experience or through scientific method he finds out new methods and teaches the common man its benefits in the easiest way they can use in a service motive. This empowerment program is intended for students under stress seeking to understand credentials and their strategic benefit in the future world to work. The workshop provided good insight to the students to cherish for a long time in the field of Engineering. The impact of this program is to develop the admirable students to maintain an optimistic, positive attitude with high self esteem to become a successful professional. Dr.J.Venu Gopola Krishnan, Principal and Dr.J.Jebastine, ECE / HOD Felicitating Dr. J. Antony Jerald, the Psychologist and Alternative Medical practitioner , Chennai. Guest Lecture on “ IOT Workshop on Robotics on at VLSI Lab. All the Second year students with two staff members benefited in the field of real time communication system using IOT and robotics. 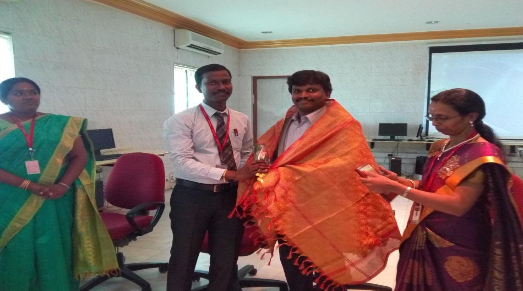 Dr.S.K.Padmanabhan, AERO/HOD Felicitating Mr.L.Venkatesh ,Assistant Manager , Proflic company,Chennai.